As an AUC graduate of the spring class 2011, I am not planning to attend the usual fahkes – lame after graduation party, which immediately brings horrific images from the movie Mean Girls and the plastics. 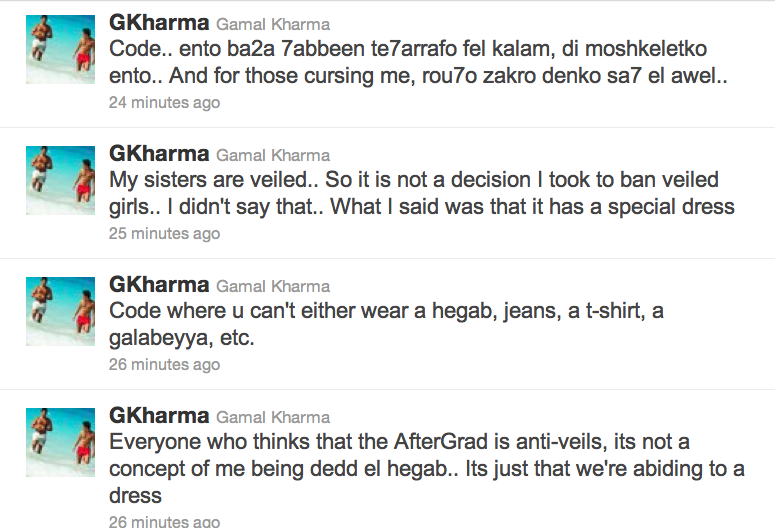 Then, during rehearsal today, I came across this piece of information via Twitter account Ahmed Abulhassan stating that veiled/hijabi girls are not allowed to attend after-grad. EXCUSE ME?!!! After making some phone calls to get to the bottom of who is actually is in charge of this event and especially this policy, I found out what was expected. 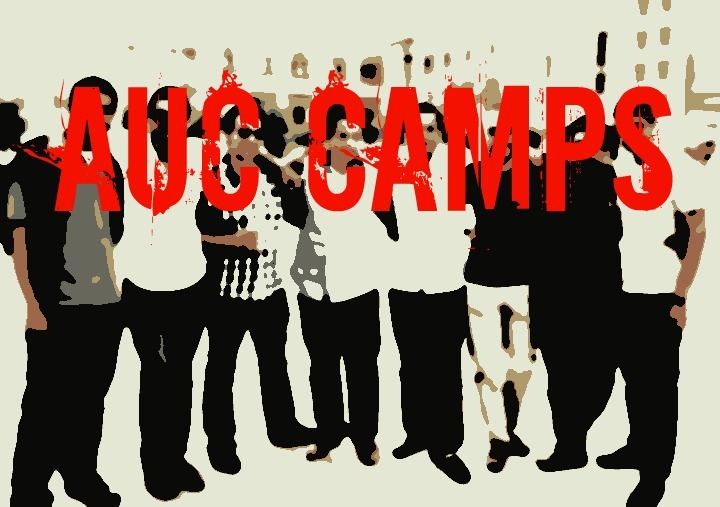 As far as I know and what I gathered from fellow AUCians, who normally attend those parties, is that this event is usually put on by AUCians of the graduating class. 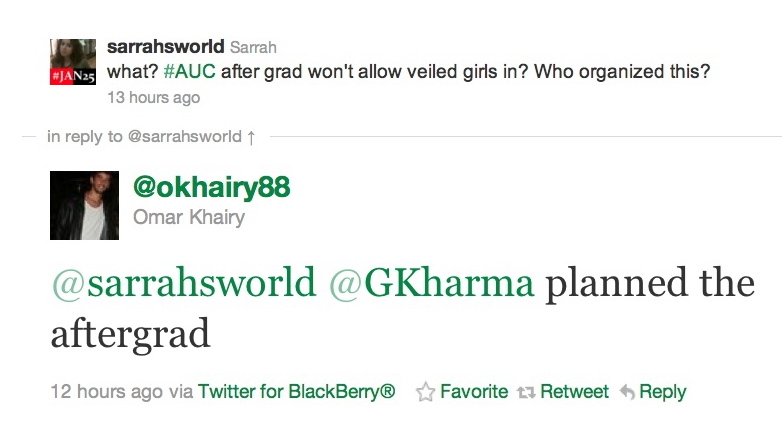 The party is planned independently from AUC as an institution, other than the name or the fact that it follows an AUC graduation. 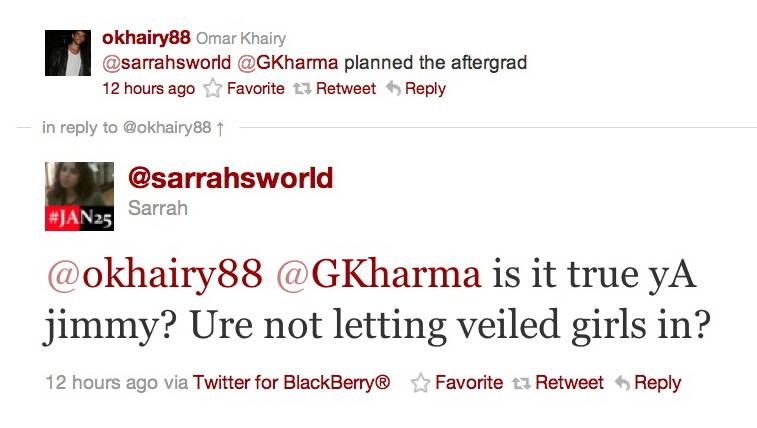 Usually the graduating class is invited except this time, whoever is in charge chose to exclude veiled girls. WHY?! Are they not pretty enough? Not appropriate for the event?! May tarnish the “cool in crowd” of the sexist/racist ignorant spoiled elitist AUCians, who get to decide who is invited and who is not? Also the hotel where the event is held allows veiled women, no problem, I attended countless weddings there full of veiled women, so it is NOT a hotel policy. Here is a testimony of a graduating veiled girl, who wrote on Facebook a note about how she feels of being discriminated against. Thank you Menna Adli El Kiey for sharing your thoughts. 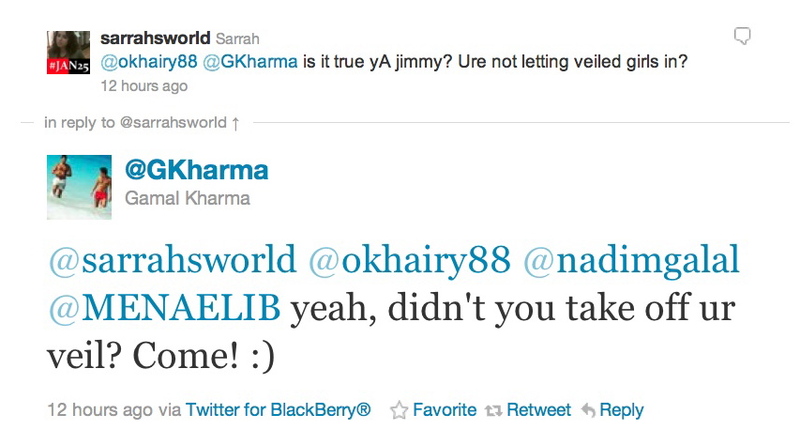 After all this digging around, I give you the douchebag of spring class 2011, who is said to be the person in-charge: Mr. I-am-too-Racist-Sexist for my shirt Gamal Kharma. Please correct me if I am wrong, or if you have any more details about this nightmare of discrimination, do let me and others know. We are suppose to be graduating and celebrating our journey of education, but it seems that some people, who discriminate, need to go to rehab to get over themselves instead of graduate. So you decide if Mr. too-sexist-for-my-shirt is a discriminatory douchebag or not? If party organizers like him have a right to discriminate, then I also have a right to criticize them and hold them accountable for such behavior. The private Facebook event is created by several douchebags including: Tamer Banna, Ahmed El-Meligy , Marwan Ziad, Dina Rizkallah Akladios. Anyone who is okay with attending this party that clearly discriminates against veiled girls is a douchebag and sexist in my book and special attention goes to the organizers. Egypt: After The Revolution from Marty Stalker on Vimeo. Something is wrong. I don’t understand British obsession with the pyramids that in almost everything related to Egypt, it has to magically make an appearance like in this video. The pyramids here in this video are the least of my problems, what about the American University in Cairo setting? 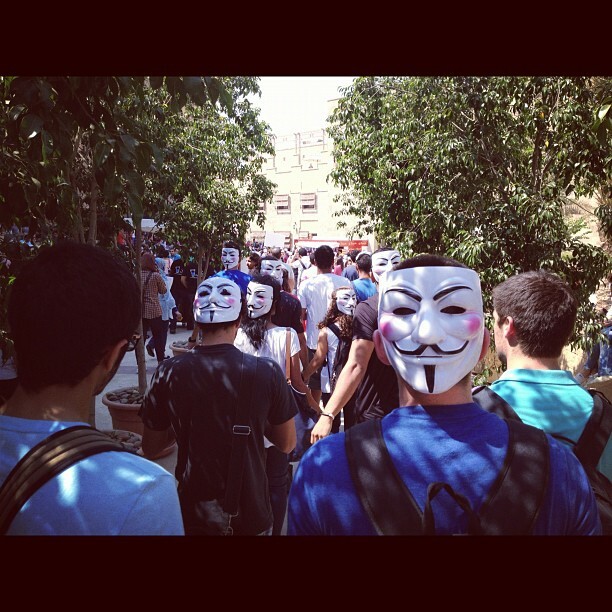 I don’t want to sound like a hypocrite myself since I just graduated from AUC, but the revolution was far beyond AUC community. 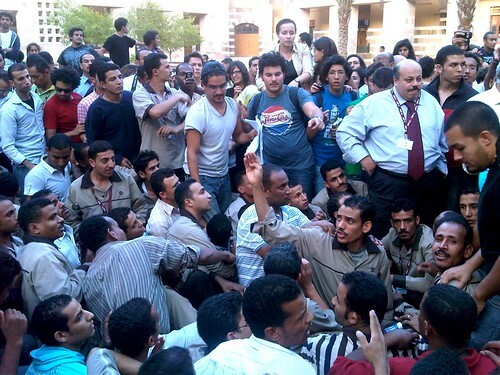 It is true that many professors, students, and staff from AUC took part in the revolution like many other groups, but by far were they the majority or the “representatives” of the youth of Egypt. I personally have been criticized for accrediting AUC for my involvement in the opposition movement on the Daily Show with Jon Stewart, but by no mean am I a representative of the youth, a face, or a symbol of the revolution. I simply speak on my own experience, which in many cases is the minority compared to the majority of Egyptians. What bothered me the most about this video is putting the revolution in the past tense, or that it is over, NO. Revolution is NOT over, it has just begun. We are building democracy from the bottom-up and that is never over in 18 days with only ousting Mubarak.